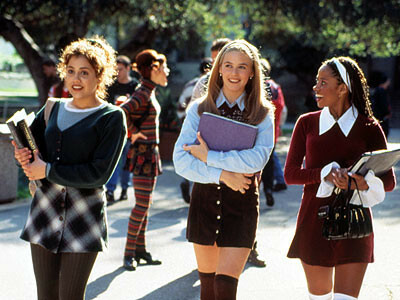 Cher Horowitz is definitely an icon of mine and always has been. In fact, she was one of the first people whose style I tried to emulate -- I wore A LOT of sheer sleeves in the late '90s. Those over-the-knee socks, patent leather T-straps shoes, and fuzzy sweaters sure looked good on her. And while Cher's always over-the-top wardrobe might be a bit outdated today, the spirit of it is enduring. Cher had fun with fashion. She wore lots of color, matched things impeccably, and carried off her look with good posture and plenty of confidence. No wonder many women still admire her style so much to the point of insisting Calvin Klein remake her classic white slip dress. I even had my own Cher moment recently if you remember. And, of course, there was the other iconic dress from the movie: the "totally important" Alïa dress that Cher is "forced to ruin" when mugged at gunpoint. 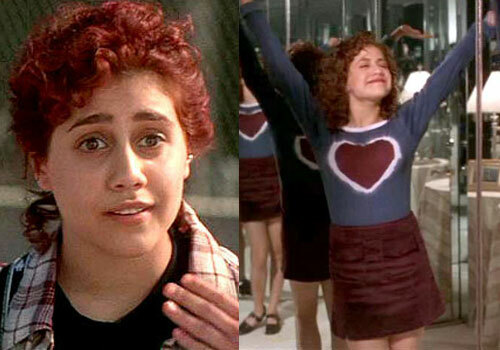 That scene displays the really thrilling thing about Cher's style: her passion for it. She loves fashion so much that she will talk back to a man with a gun if it means sparring her special dress from ruin. And, a day spent shopping is almost always the thing to cheer her up . . .
Cher knows the power fashion can have on a person's whole life, which is why she shows kindness to Tai, the new girl, by giving her a makeover. Well, that and, as her best friend Dionne explains, "Cher's main thrill in life is a makeover. It gives her a sense of control in a world full of chaos."